There are very few things in nature that can cause as much devastation as a fire can. Fire can be especially devastating to your home or business. 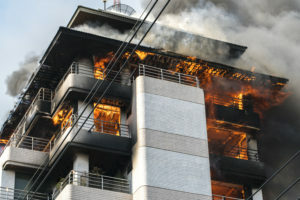 When a fire damage disaster strikes your property and after the fire trucks have left, your home or business likely suffers from fire, smoke, and water damage. When it comes to a fire damage disaster the first step you should take after the fire has been put out is to call a restoration team as soon as possible, it is important to begin the restoration process immediately. The professionals have specialized training in cleaning up a fire, smoke odors and the extensive water damage left behind. Smoke and soot can be acidic and can cause damage of its own on nearly any surface it comes in contact with. Textured and porous surfaces are the most vulnerable to smoke and soot staining. Attempting to clean up smoke and soot damage on your own could be disastrous. Not all smoke and soot residue is created equally and the removal and cleanup process varies for each type. Dry Smoke – Residue from dry smoke occurs when a fire is fast burning and at a very high temperature. This type of smoke residue is typically powdery, dry, and causes very little smearing when touched. Wet Smoke – Residue from wet smoke occurs when the fire is smoldering and at a low temperature. A wet smoke residue is sticky and comes with a strong unpleasant smoke odor. Wet smoke residue smears easily and can be difficult to clean up properly. Protein Smoke – Protein smoke residue is almost invisible and often causes discoloration in paints, varnishes, and other finishes. This type of residue also has a very strong unpleasant smoke odor. Oil Smoke Residue – Residue from fuel or oil is usually found in fires that are caused by petroleum products. More commonly this type of residue comes from furnace puff backs. This type of residue is often sticky and difficult to remove or clean. Once the fire damage cleanup professionals arrive they will assess the extent of the damage. This is an important first step. Understanding the extent of the fire damage can help the restoration company come up with a comprehensive plan of action that allows them to clean and restore your property safely and efficiently all the while providing you with an accurate quote for how much the process will cost. Once the fire damage cleanup and repair process begins in earnest, the professional’s main priority is to prevent any additional damage while repairing the damage that has already been caused. Most fire damage disaster will be followed by water damage from the efforts of putting out the fire. If the excess moisture in your home isn’t dealt with in a timely manner mold can start to grow, causing more damage and property loss. Don’t risk your health, safety, and checkbook by trying to perform fire and smoke damage cleanup and repair on your own. Professionals have the proper training and equipment to perform the task safely. ERX Emergency Restoration is certified and licensed to help with fire, smoke and soot damage.